Hello my lovelies, yes I am still alive. I am having a few days up in Cairns, Rachel (daughter) and I flew up here Saturday morning to spend some time with Shane (son) and Stacey (sons girlfriend) for both of their 30th birthdays. Stacey turned 30 on Friday and Shanes birthday was Sunday. Saturday was spent just catching up. Then Sunday Shane, Rachel and I headed of early in Shanes boat to do some fishing on the edge of the world famous "Great Barrier Reef". It is illegal to fish over the reef so that is why we fished at the edge. It was a glorious day, probably around 26c with very little wind and the bluest water you could ever imagine. In a couple of areas while travelling out to our fishing spots we were lucky to be able to see the reef under us. We caught quite a few beautiful fish, but most were under sized so they went back, but we ended up getting enough for a meal for the four of us tonight. After getting back from fishing and having a well needed shower we went out for dinner to have a birthday celebration for both Shane and Stacey. Today has turned out to be quite a lazy day, Stacey had to go to work so Shane, Rachel and I went out for lunch. As a mum it is so nice to spend time with my two children at the same time. It is such a rear occurance and because I have no siblings, it is a joy to see my kids - now adults - bounce of each others sense of humour as the did when they were little people. I will have to wait until I get home to upload some of my photos because I forgot to bring the cord. 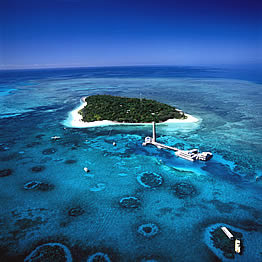 But below is a free photo of Green Island and the reef, which is just near where we were.